So you've set yourself up as a member of a performing rights organization. Congrats, you're off to a great start! However, there are still many different income sources that they ASCAP or BMI do not collect. Let's find out what you might be missing. Performing rights organizations (ASCAP, BMI, SESAC) only collect performance royalties, not mechanicals. When you join Songtrust, we will register your songs with Harry Fox Agency (the US mechanical licensing agency) and other mechanical collection societies worldwide. With your music registered for mechanicals, artists we be able to obtain mechanical licenses to release cover versions of your songs. Outside of the US, music retailers (iTunes, Rhapsody, etc) are required to pay mechanical licensing societies (think Harry Fox Agency but in other areas of the world) around 9% of revenue earned from each download. This amounts to about 9 cents per digital download, owed to the songwriter. This money sits at the mechanical society until it is collected by a publishing administrator like Songtrust. If you have international sales, you are likely missing your international mechanical royalties. ASCAP, BMI, and SESAC are designed to collect performance royalties in the US. Songtrust registers your songs directly with international performing rights organziations worldwide and collects royalties directly from these sources. 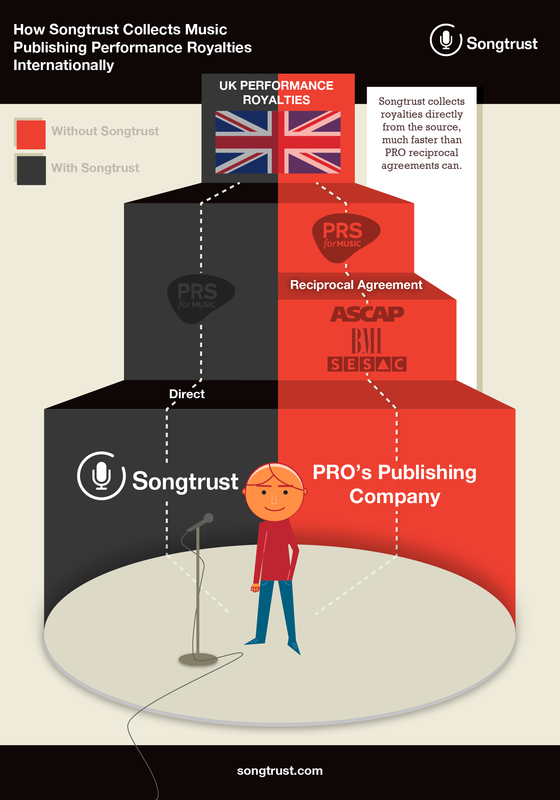 Our direct agreements function faster and more efficiently than ASCAP/BMI/SESAC's reciprocal agreements. Not yet affiliated with a PRO? When you join Songtrust, we will help you become a member of ASCAP or BMI!